LOWEST PRICE GURANTEED IN NORTH AMERICA. Cassie Acacia farnesiana, known as Cassie or Yellow Cassie is a mimosa with feathery leaves. It flowers in fragrant yellow globes. Cassie is a mimosa resistant to drought but vulnerable to cold. It flowers mainly from November to March and the perfume extracted from the flowers is in form of pomade. The absolute is prepared by mixing the pomade with alcohol which is allowed to stand for 3-4 weeks at about -5°C. The alcohol is then separated and distilled over. The extract obtained is a dark yellow viscous liquid with strong odor of Cassie flowers. 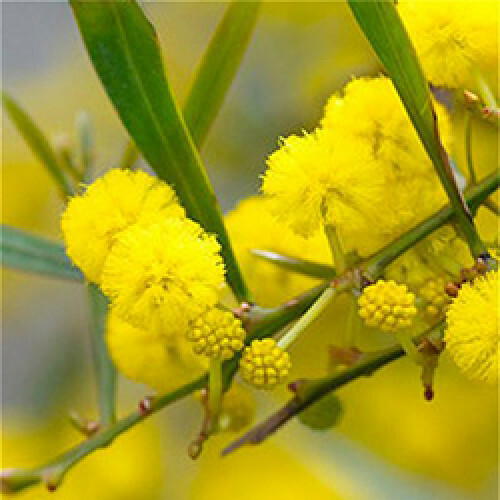 Well known to the perfume industry, Cassie Absolute is used in numerous perfumes in a way similar to mimosa, for its sweet, honey notes. In aromatherapy it is considered to be soothing, inspiring and said to aid in depression. It is also known for its aphrodisiac properties.